AVAILABLE IN 2 LB, 5 LB & 12 LB BAGS. Deboned Cod, Turkey Meal, Chicken Meal, Green Lentils, Whole Peas, Chicken Fat (preserved with Mixed Tocopherols & Citric Acid), Deboned Duck, Natural Flavor, Miscanthus Grass, Ground Flaxseed, Dried Chicory Root, Dried Kelp, Dried Sweet Potato, Dried Cranberries, Calcium Carbonate, DL-Methionine, Taurine, Yucca Schidigera Extract, Zinc Proteinate, Choline Chloride, Vitamin E Supplement, L-Ascorbyl-2-Polyphosphate (source of Vitamin C), Iron Proteinate, Niacin Supplement, Copper Proteinate, Thiamine Mononitrate, Calcium Pantothenate, Vitamin A Supplement, Manganese Proteinate, Pyridoxine Hydrochloride, Sodium Selenite, Riboflavin Supplement, Dried Bacillus coagulans Fermentation Product, Vitamin B12 Supplement, Calcium Iodate, Folic Acid, Rosemary Extract. 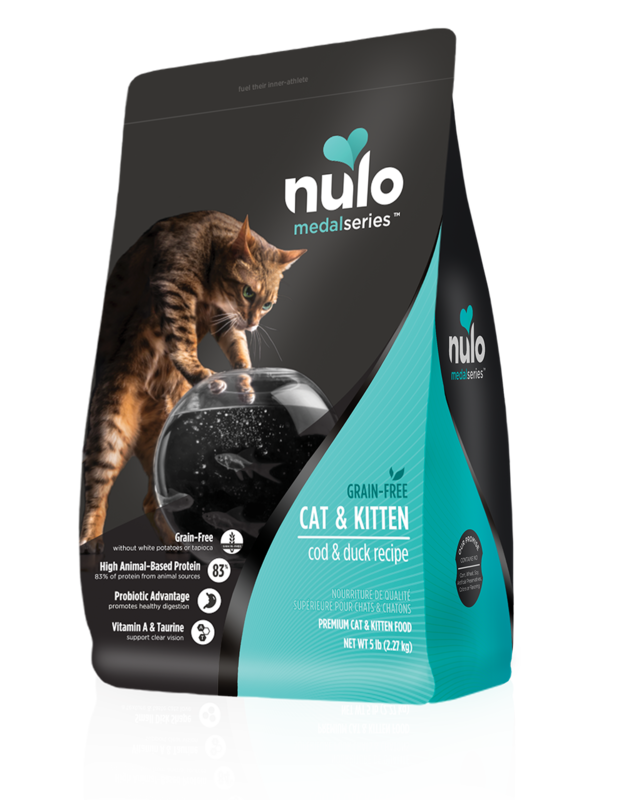 MedalSeries Cat & Kitten Cod & Duck Recipe is formulated to meet the nutritional levels established by the AAFCO Cat Food Nutrient Profiles for all lifestages.